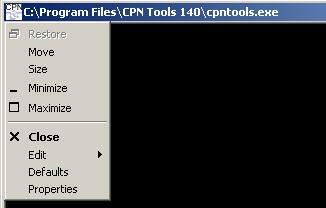 CPN Tools can be closed by closing either the workspace window or the console window. Each of these windows can be closed in several different ways. The Close button can be clicked in the upper-right-hand corner of the workspace window. 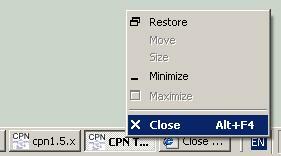 The Close entry can be selected in a menu after clicking on the CPN icon in the upper-left-hand corner of the workspace window. The Close entry can be selected after clicking with the right mouse button on the button for the workspace window in the taskbar for Windows. Note that the button for the workspace window is always to the right of the button for the console window. These same methods can be used to close the console window. The above information is not saved if the console window is closed before the workspace window.